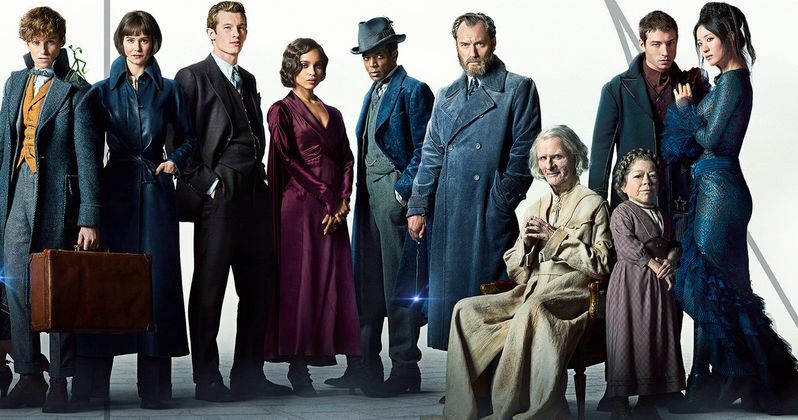 Fantastic Beasts: The Crimes of Grindelwald released a brand-new poster and trailer at San Diego Comic-Con this afternoon, which provides the first-look at alchemist Nicolas Flamel. In the film, Flamel is played by actor Brontis Jodorowsky, and the character is someone that Harry Potter fans have been wanting to see for quite some time. The character is more of a historical figure in the franchise and the creator of the Philosopher's Stone as well as a friend of Albus Dumbledore, who lived in France. Fantastic Beasts: The Crimes of Grindelwald has scenes that take place in Paris, which is where Nicolas Flamel resides and Newt Scamander goes to find him. Dumbledore needs his help to bring down Gellert Grindelwald. The trailer for the sequel explains that Flamel is a master alchemist who, in addition to the Philosopher's Stone, was also able to create the Elixir of Life, which allows him to live for a very long time. It's at this point in the trailer where Scamander realizes the true power of Flamel. Johnny Depp's Gellert Grindelwald is a big focus in the new Fantastic Beasts 2 Comic-Con trailer. Grindelwald wants wizards coming out of the shadows. It's later revealed that Albus Dumbledore cannot face Grindelwald himself, and that Newt Scamander has to do it. This leads to Depp's Grindelwald to ask Scamander, "Mr. Scamander, do you think Dumbledore will mourn for you?" It's a powerful scene and all of this together makes one wonder just how much Nicolas Flamel will be able to help Scamander on his mission. During the Fantastic Beasts: The Crimes of Grindelwald panel at Comic-Con, Johnny Depp came out on stage in full Gellert Grindelwald costume and makeup, delivering a speech to the ecstatic crowd. Depp wasn't the only member of the cast in San Diego for the panel. Eddie Redmayne took to the stage as well along with the rest of the cast, to thunderous applause. Fantastic Beasts: The Crimes of Grindelwald already looks to be an epic follow up to the first installment, which was well-received by critics and fans alike. Fantastic Beasts: The Crimes of Grindelwald stars Eddie Redmayne as Newt Scamander, Jude Law as Albus Dumbledore, Dan Fogler as Jacob Kowalski, and Ezra Miller as Credence Barebone along with Johnny Depp as the aforementioned Gellert Grindelwald and Brontis Jodorowsky as alchemist Nicolas Flamel. Harry Potter fans were already pretty hyped for the sequel, but the Hall H panel along with the tease of Flamel and the true evil powers of Grindelwald have sent some fans into crazy excitement. Now would be an excellent time to dust off some books and get to reading before the movie hits theaters this November. You can check out the brand-new San Diego Comic-Con trailer along with the new Fantastic Beasts 2 Comic-Con poster below, provided by the Warner Bros. Pictures YouTube channel.